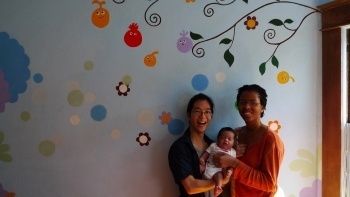 Here's one of the cutest nursery paint jobs you're ever going to see: A full-blown LocoRoco room painted by a professional set designer. Ah, LocoRoco. I won't pretend to know a thing about it, but it's bright, it's colorful and it's ridiculously cute. It's also one of the favorite games of Mach Kobayashi and his wife Tracy. So when their friend Asaki Oda offered to paint the nursery for the baby they were bringing home from India, they knew what had to be done. Because Oda isn't just a pal with a brush and some free time: She's a professional set designer for theaters and clothing stores. While the parents were off to India for a month to pick up Dyson, their baby, Oka and four other friends went to work. The results speak for themselves: A LocoRoco room that looks like it was lifted straight out of the game. Lots of nurseries have fancy paint jobs, but very few can bring the pwnage like this one. Will Dyson grow up to like LocoRoco as much as his parents do? I think the safe bet is yes.